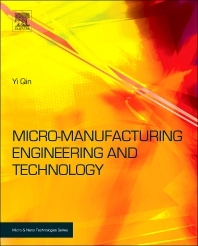 This book presents applicable knowledge of technology, equipment and applications, and the core economic issues of micromanufacturing for anyone with a basic understanding of manufacturing, material, or product engineering. It explains micro-engineering issues (design, systems, materials, market and industrial development), technologies, facilities, organization, competitiveness, and innovation with an analysis of future potential. The machining, forming, and joining of miniature / micro-products are all covered in depth, covering: grinding/milling, laser applications, and photo chemical etching; embossing (hot & UV), injection molding and forming (bulk, sheet, hydro, laser); mechanical assembly, laser joining, soldering, and packaging.